Washtenaw County’s Board of Commissioners are finding themselves in the public view. Now they are providing more transparency about the County Administrator search. In our last post, Breaking News when the News is Broke, we tell how Mary Morgan broke the story of the vacant opening for a high-paying, high-responsibility County staff position (Director, Office of Community and Economic Development, or OCED) and the effort by a sitting commissioner, Conan Smith, to apply for that position while retaining his seat as a commissioner, with her open letter to the BOC, posted on Facebook. As we commented in a series of three posts about the difficulty in getting local news in Ann Arbor, it has been difficult to learn what is happening at the Washtenaw County Board of Commissioners, at least through news media. 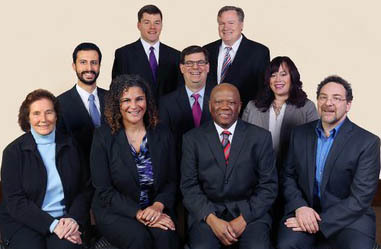 Washtenaw County Board of Commissioners, 2014-2016. Conan Smith at far right. Possibly because of Mary’s coverage (and we helped publicize it), the BOC seems to have wakened up a bit and they are now addressing some pending issues with alacrity. Things happened pretty fast after the potential conflict of a sitting commissioner applying for a staff job was highlighted on social media. Conan Smith resigned as the Commissioner for District 9. (Coverage by the Ann Arbor News.) The BOC held a very open process for applications to fill the seat. Jen Eyer was appointed by a unanimous vote. (See previous post for updates.) But whoops. Smith is still on the ballot for November. As detailed in the followup in the News, he could still be the District 9 commissioner in January. The newly appointed commissioner and possibly some others will be on the ballot as write-ins. Whether Cmr. Eyer can surmount the considerable obstacles to winning as a write-in in a Presidential year (especially since Michigan has a straight-party option for voters) is yet to be seen. I would like to make it clear that I am not alleging in what follows that Greg Dill would behave unethically by making such an appointment solely with regard to his own advantage. In fact, this situation puts him into a difficult position. Dill makes a decision about the OCED position before January. He chooses Smith. Smith will then resign his seat as a commissioner in January and the BOC will appoint his successor. Smith himself has no influence on whether Dill is hired before or after January. Dill makes a decision about the OCED position before January. He chooses another person to fill the position other than Smith. Smith resumes his seat as Commissioner. He has a role in the decision to hire Dill after January, but not if the Administrator position is filled before then. Note: the position description for the OCED position is no longer on the County website, and the other applicants for the job are not publicly known. Fortunately for all around, the BOC has moved with some alacrity to resolve this situation. On September 14, they voted in a resolution that will resolve the question of the County Administrator with a definitive choice by October 19, 2016. A position vacancy was opened August 13-September 13. There were quite a few applicants. Greg Dill is one of them. Application packets and information about the process are posted here. The process calls for Corporation Counsel (Curtis Hedger) and Human Resources (presumably Diane Heidt) to do a first-round elimination of some candidates from the list. (Such initial sifting usually is done on the basis of obvious suitability in terms of background and experience for the position. It is usually quite neutral with regard to personal attributes.) The survivors will then be scored according to qualities pertaining to six aspects of performance. The BOC will vote to include 4 finalists on September 21, presumably at their regular business meeting. (It has not yet made it onto the agenda.) Meanwhile, there is an effort to obtain public comment. Interviews with the finalists will be at a special meeting on October 15. (Begins at 8:00 am. The public is invited!) The commissioners will, wisely, not vote on that day. The interviews will evidently be taped and made available for viewing. On October 19 (a regular scheduled meeting), the BOC will “vote” on the four finalists. The mechanism is very subtle – rather than a show of hands at the meeting, each Commissioner will submit his/her top choice to the Clerk ahead of time. If no candidate has the majority of the “votes”, the BOC will continue with a straw vote (show of hands) until a majority is reached for a candidate. They will then vote on the formal resolution to hire a new County Administrator and direct the Corporation Counsel to negotiate an employment contract. Neat and tidy! The list of applicants to be considered is long – very long. There are 31. List here. I’m curious about how the notice was phrased and how it was distributed. Some of the applicants are startlingly under-qualified. “Cashier at CVS in Southgate” “Maintenance/grounds employee for University of Liggett School in Grosse Pointe Woods”. Some candidates evidently have more suitable backgrounds, but perhaps a spotty job history. “Not currently employed. Former city administrator for several Michigan communities, including Ecorse, Middleville, Homer and Battle Creek.” But there are a number of suitable candidates, including the former top two finalists (Muddasar Tawakkul and Bob Tetens) and the current Interim Administrator (Greg Dill). There are also Michael Norman , County administrator for Branch County, Michigan, and Larry Collins, City of Ann Arbor Fire Chief (oh oh). I’m not listing several others who might pass that first filter; evidently the BOC will have a good list of finalists to choose from. It will be a relief to see the resolution of this first half of the uncertainty around the situation created by Conan Smith’s move to secure a high-placed County position. It’s good to see the Commissioners move so resolutely. NOTE: Apparently this was postponed till October 5, per Mary Morgan’s post from the September 21 meeting. SECOND UPDATE: (September 21, 2016) A conversation on Facebook (where else?) reveals the top 4 candidates for County Administrator. It includes the former top two contenders along with the current Interim County Administrator. 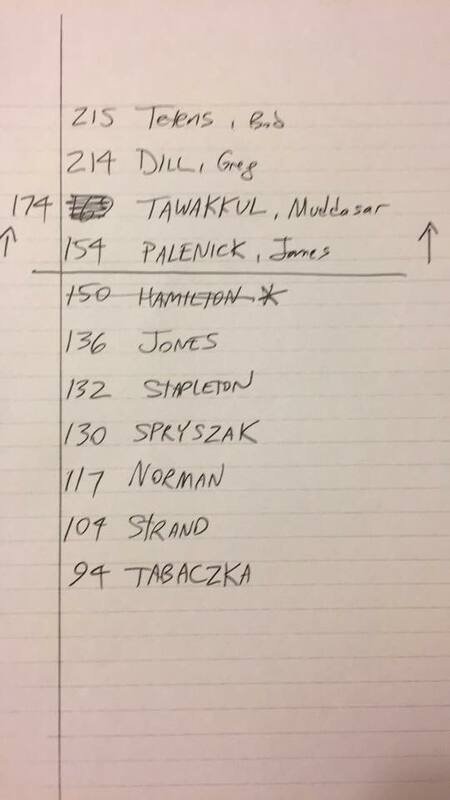 The image is of the candidates ranked by scores, from the hand of Yousef Rabhi (posted on Mary Morgan’s Facebook post). They’ll be interviewed on October 15 as described above. THIRD UPDATE: (September 26, 2016) Those who follow Dave Askins’ Twitter account were treated today with access to images of the letters of application to the OCED position. Dave had done a FOIA to obtain them and he has now made them available on DropBox. We will try to provide detail in another post. NOTE: See From Drama to Melodrama: Washtenaw County and Conan Smith. POSTSCRIPT: (October 20, 2016) The BOC met as scheduled and selected Greg Dill as the permanent administrator. Here is the Ann Arbor News report. This entry was posted on September 19, 2016 at 6:54 pm and is filed under media, politics. You can subscribe via RSS 2.0 feed to this post's comments. You can comment below, or link to this permanent URL from your own site.